Unlike email messages you can send in and out of Facebook, chat conversations do not leave a "log" to which you can refer at a later time. So, what should you do if you want to keep, download, and save a Facebook Chat conversation? In this tutorial, we will show you a workaround and quick trick that allows you to save chat conversations with your Facebook friends on your computer's hard drive, just like any other file. First, if needed, click on the chat conversation you want to save (it may already be opened). Then, place your cursor (mouse pointer) at the end of the very last response sent by you or another Facebook user during that chat exchange. Click on the mouse button, and hold it pressed. The text you have selected from the Facebook chat conversation is now in your operating system's "clipboard", just like when you copy text from elsewhere. You will now need a recipient program in which to paste the copied text from the chat messages, so that you can save them and keep a downloaded copy of the conversation on your computer (PC or Mac). Just launch a text editor of your choice (like Notepad on Windows 7 / Vista / XP, TextEdit on Mac OS X, gedit on Linux, etc.) Then, right-click inside the text editor, and choose "Paste" from the context menu. 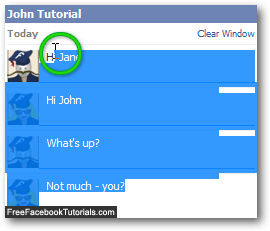 Your Facebook Chat conversation should now be inside the editor. Now save the file with a meaningful name, inside an easy-to-remember folder location. Until Facebook offers an alternate way to save and download copies of your chat conversations, this quick tip will do, and allow you to keep a record of your chats for posterity!